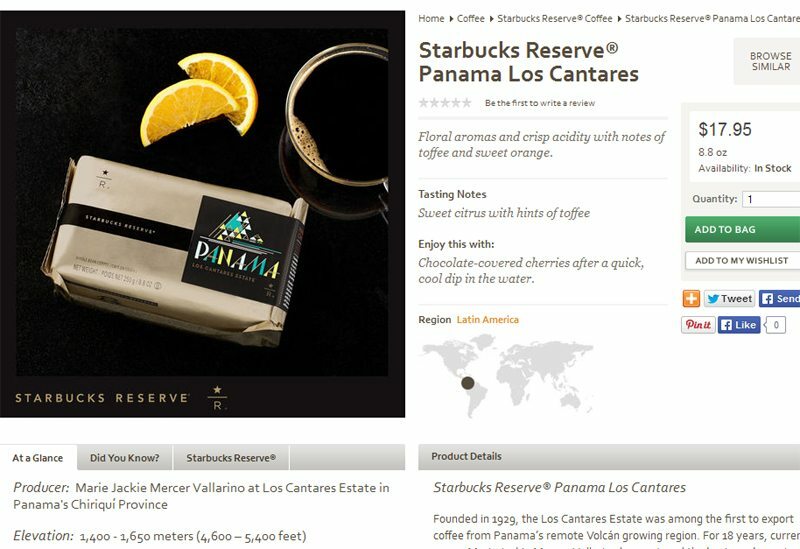 A look at Starbucks Reserve coffees from Panama. Tonight (September 9, 2014) I attended a coffee seminar presented by Starbucks coffee headquarters partner Leslie Wolford. 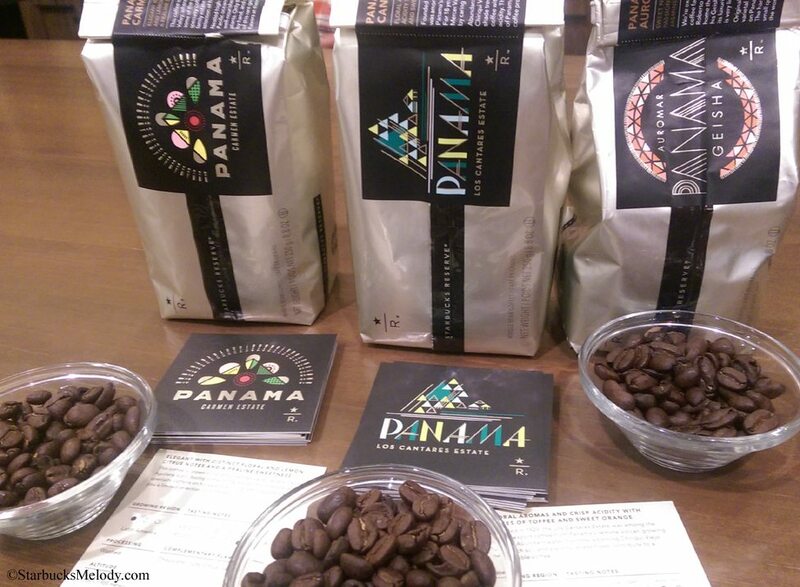 We compared and contrasted three coffees from Panama, all sourced from different farms. All three coffees come from the Volcán growing region of Panama. Leslie Wolford is 24-year Starbucks partner who is part of a small team of people at the Starbucks headquarters who selects new coffees as Reserves and develops blend recipes as well. The now-famous “Starbucks Micro Blend 11” was Leslie’s creation. (Scroll down for a picture of that Reserve coffee bag – I didn’t know until this tasting that it’s called number 11 because it was her eleventh iteration of beans to get the perfect blend that she wanted). This was an incredible opportunity to hear Leslie speak. I wish you could have been there. She is incredibly knowledgeable and radiates her passion for coffee. And as a 24-year partner, she can talk about anything Starbucks. It was inspiring to have this opportunity. At one point, we chatted about what Starbucks was like 24 years ago, and she commented that when she began in the stores, there were only three syrups: Almond, Vanilla, and Hazelnut and essentially customers could only buy coffee, lattes, or espresso. 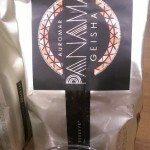 All three Panamas are roasted to the lighter end of a Starbucks roast profile (think anywhere from a blonde roast to, at the darkest, Breakfast Blend), and all are washed-processed coffees. We tried all the coffees made by a French press. We began the coffee seminar with the Panama Los Cantares Reserve Coffee. This coffee is sourced from the a farm owned by Jackie Mercer Vallarino, who as a grower as won numerous awards for the Geisha category coffees. This farmer has interesting practices when it comes to coffee cherry picking. The Nobe –Bugle are an indigenous people (native to this remove area of Panama) who live in the mountains and come down to harvest coffee. Jackie has created a system to house and look after the tribal families that pick coffee – including looking after the education and healthcare of the tribal member’s children. And of course, they’re paid for their work. 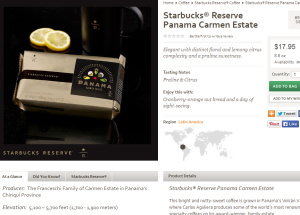 The Panama Los Cantares Reserve had a lot of aroma – you could get the citrus notes even in the aroma. The acidity of the orange flavor notes hit upfront and then left you with a clean cup of coffee. It has a chocolatey mouth feel and soft flavors. What a great cup of coffee. The coffees grown on this farm are influences by the microclimates created by a river that runs through this farm. It’s grown at about 4,500 feet to 5,000 feet. What a great example of how coffee is a farm product and the magic of the land influences the flavors. 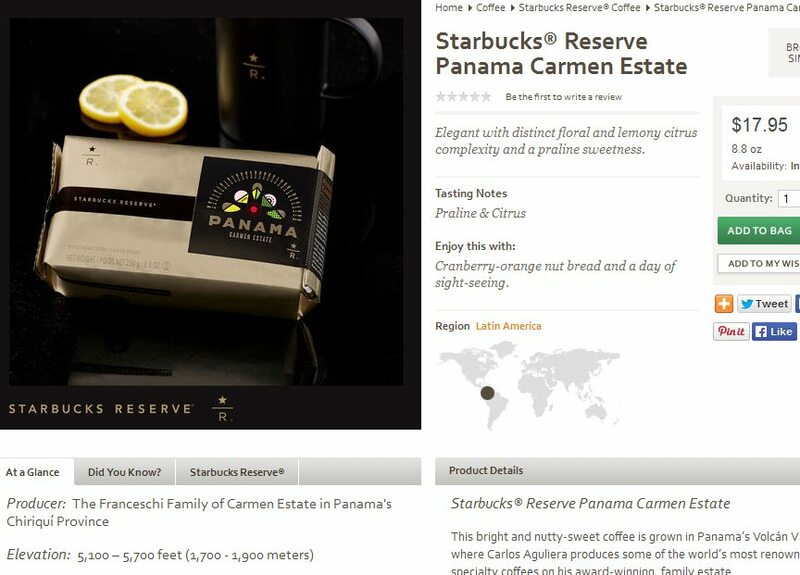 Next we tried the Panama Carmen Estate coffee, grown at 6,000 feet. This coffee farmed is named after the woman who founded it in the 1960s, who was the grandmother of the current family farming this land. This is the same varietals as the Panama Los Cantares coffee yet produces a completely different cup of coffee. Another perfect example of how the magic of the microclimates of a farm and the processing method will affect the coffee. Our group noticed that this coffee has a lot less aroma than the Panama Los Cantares but was full of flavor. It has a praline sweetness to it and a lemony acidity. The farm uses a high pressure washing method instead of the full fermentation step to wash his coffees. (In a washed processed coffee, most go through a full immersion soaking, instead these coffee cherries are subject to high pressure water). The high pressure water is reclaimed and can be used for irrigation and the farmers find that they use less water in the washing of the coffee, a sustainable practice. This farmer sells his coffee beans lot by lot, with heavy competition to buy their coffee. Many independent coffee businesses are known to buy a lot here and there of this farmer’s green beans. Carlos Aguliera produces some of the world’s most renowned specialty coffees on his award-winning, family estate. By the way, I loved this coffee tasting. It was amazing to taste the distinct and clear flavor differences in this small batch coffees, all of which retain their origin flavors. 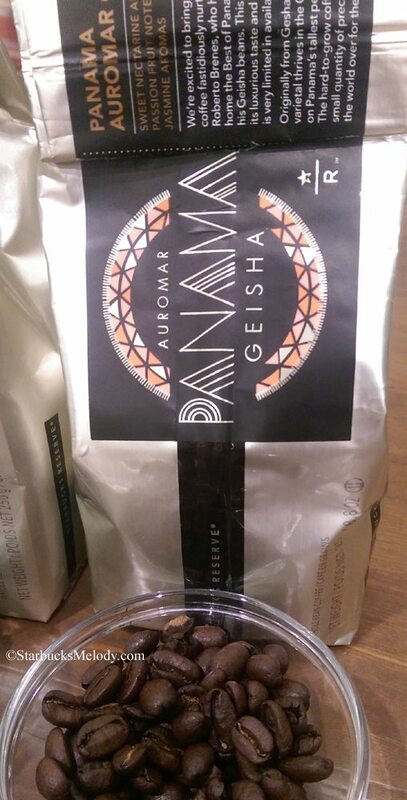 Third we tried the Panama Geisha Auromar coffee, which is not available in stores and sold out online at StarbucksStore.com. This was a floral and complex coffee. Starbucks sourced about 1,000 pounds of this harvest of it, and sent some to Reserve stores in Japan, and sold the remainder on StarbucksStore.com, until gone. This coffee had lots of tropical flavors and floral flavors. It explodes as a sweet and juicy cup of coffee. The farm offering this produces coffee on about 17 hectares of land, but owns in total about 30 hectares the remainder of which is native forest creating shade and micro growing climates. This farmer is known to pick the coffee cherries just slightly later than many farmers do – in other words, the coffee cherries are slightly over ripened. This creates risk of spoilage but the farmer has been able to create great coffee with wonderful berry notes. This kind of coffee tasting is sometimes called a “vertical” coffee tastings – tasting and comparing across one growing region. This was superb for my coffee education. I could have written more. I learned more about the farms, micro climates, and truly was able to appreciate how three coffees all from Panama can all taste totally different from each other. 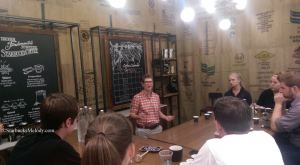 Thank you Leslie for volunteering your time to walk us through an inspiring and education coffee seminar! 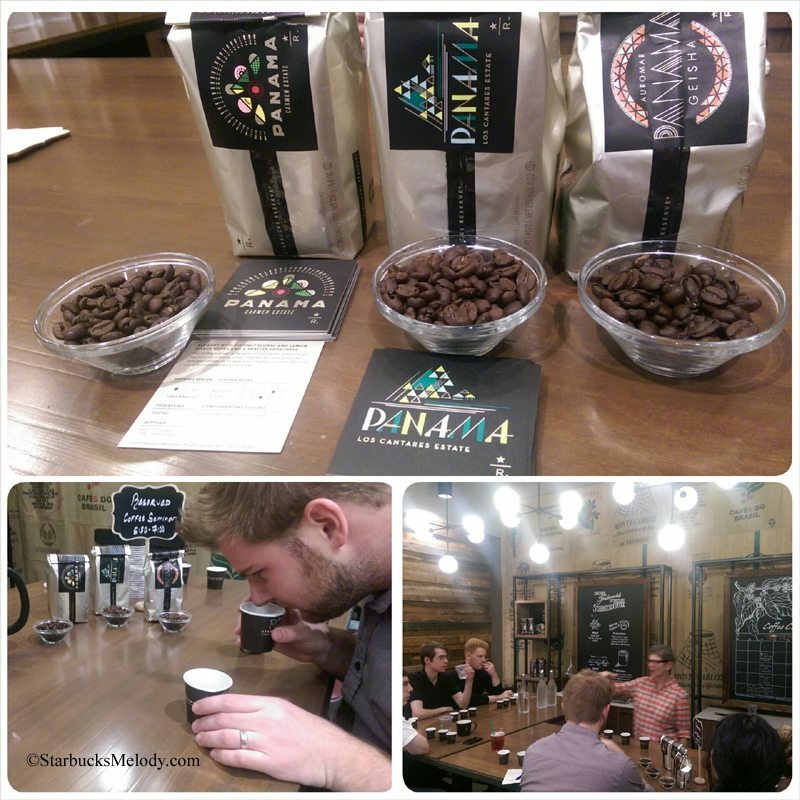 Coffee tasting: Starbucks Kape Vinta and Muan Jai coffees. From the Roastery to your doorstep. Great article Melody! I love the Reserve coffees as does my husband. He would not shut up about how amazing the Geisha was that you sent 🙂 or the Ethiopian. Who makes the designs for the Reserve cards and do the designs reflect the places/farms they come from. 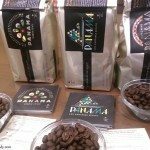 Why does it feel like there is an increase in Panama coffee recently? 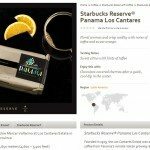 Every time I look on the store site it seems that they have at least two or three Panama coffees for sale. Have they just recently had a great harvest or have many of the farms Starbucks gets lots/samples from finally met C.A.F.E. practices or other standards that have ruled them out in the past? Wow melody! You really capture the seminar! I am impressed with how much info you remembered! Thanks for sharing our seminar with everyone! Hi Melody, thank you for another great educational article you have provide for us as customers as well as our Barista of Starbucks! I have to share this with you … ” you are an amazing blogger for Starbucks”! Because, I know more information from you than the company I work for itself. I am in my 8 years working for Starbucks as Barista who care about coffee a lots. I was very fortunate to get to transfer to our first Clover Store in Boca Raton, Florida and I can’t say enough, your article just arrive in time for me to read all about Reserve Coffee. I am so glad I have you in my subscription. Thank you so much.